A card arrived in the mail Wednesday. A good friend remembered that my sister’s birthday is November 18. It is six months since she died and I spent her birthday with her last year. This November 18 is the first time in my life that I will not be able to say “Happy Birthday” to her. This is the first year that I will not hear her lovely voice in response. I have not been crushed with grief since my sister died. I don’t think of her every day or fixate on her memory. Many would unknowingly say that I have “recovered” from losing her physical being. Except…except…whenever I am standing in front of an airport Arrivals and Departures Board and see “Halifax”, I remember my monthly trips to see her. I can vividly recall – as vividly as a “flashback”, I would say – driving to her long term care home. I can feel myself walking the few hundred steps to the door and fumbling in my phone for the code to enter. The smells of the institutional kitchen, the disinterested attention of the residence cats and the faces of the ladies in the lounge knitting or crocheting all come back to me. There were lovely paintings on the wall and I remember these particularly for I would often push her around in her wheelchair to look at them, again and again. I go to art galleries all the time, but it was in those corridors with Nan that I truly realized that you can look at a picture over and over and see something new each time. I also remember textures – the cotton pieces of the quilt I made for her bed and to brighten her room and the sweater I knit that she always wore to keep warm. I remember the irregularity of the stitches and the boniness of her shoulders as I gave her a hug, a long hug so that my tears had stopped by the time I looked at her. I remember all these things. My “recovery” is not so certain. The thought that this week was my sister’s birthday was already in my mind when my friend’s card arrived. I was already remembering her birthday last year. She was gleeful as she opened the fingerless mitts I’d knit her. She wiggled her fingers and giggled, “I see you ran out of time.” She wanted cupcakes and Tim Horton’s coffee. My son went out to buy her both. It is at times like this, with sad/happy tears blurring my vision that I miss her. I miss her for the good times, for which she was always the most enthusiastic participant. My remembering is a way of thanking her – and thanking my friend, whose birthday is also November 18 – for all those happy times. There is no “recovery”, only good remembering. It’s always lovely to hear from people who remember Nan as you do. Thank you for taking the time to comment. Thank you, Lisa. As I said in this short essay, Nan was the “most enthusiastic participant” of every fun activity. 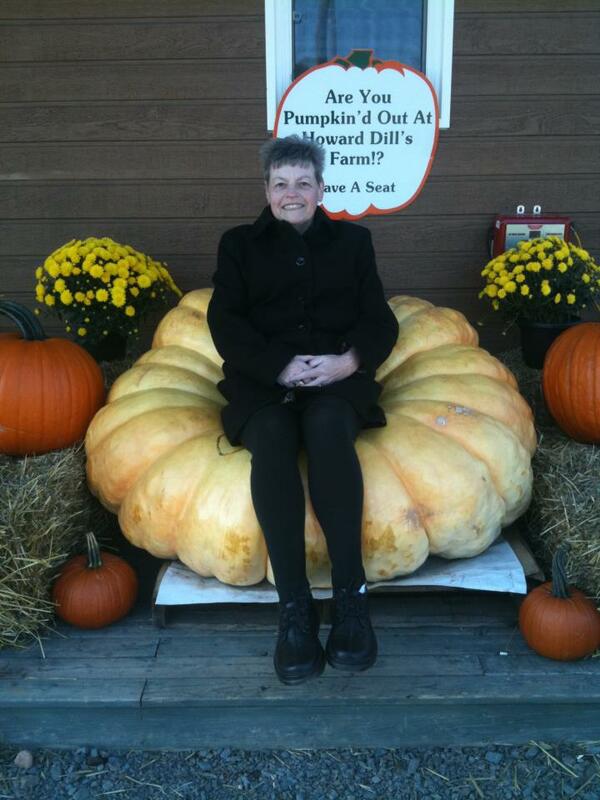 ANd have sat on a pumpkin like that at Howard Dill’s! Great memories and nice to share them. Thanks so much, Darren for taking the time to comment. I hope you’re doing well. Very touching and emotional Gail. I lost my mother 5 years ago this month. A friend of mine sent a note expressing support for my loss. I told her that I don’t think about the day she died but instead think of all the wonderful memories from our life time together. For my own mental health, it is much safer to remember the happy times. Thank you, Suzanne – you’re right. Good memories are the best way to remember someone.